…using butter yellow thread. I like the looks of it on the off white background. I am over 1/2 way finished, but have had to quit and do something else. This is free motion “straight” lines. I like the unevenness of it. This week a friend and I have been working on a t-shirt quilt that has to be done by Christmas. We made great headway yesterday getting it pieced together. Good thing I bought a heat press or we would still be working on fusing the interfacing to the shirts. It will be going to the quilter EARLY next week. 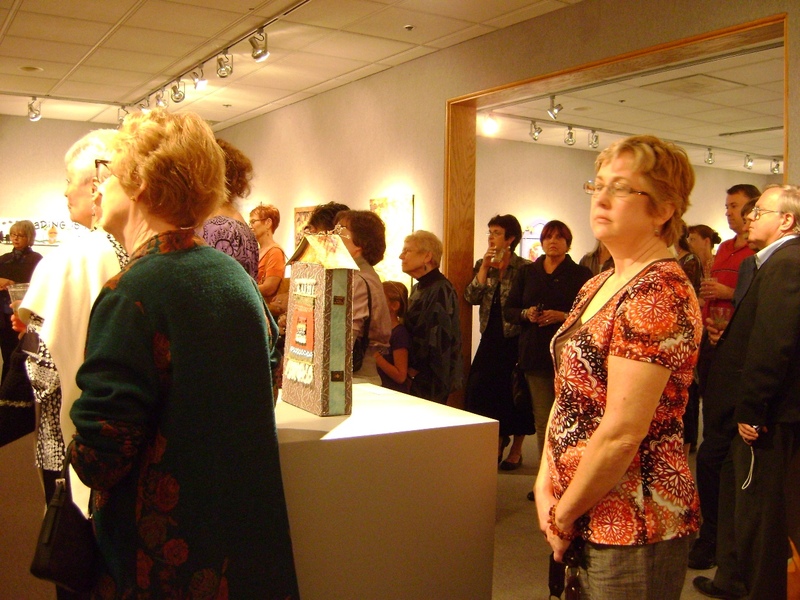 And THEN I have to get ready for an art spree the following weekend at the Rend Lake Center. No rest for me! How to stitch? That is the question. Basting today. Don’t want to hold up my fellow collaborators more than I already have. We have to get this show on the road! 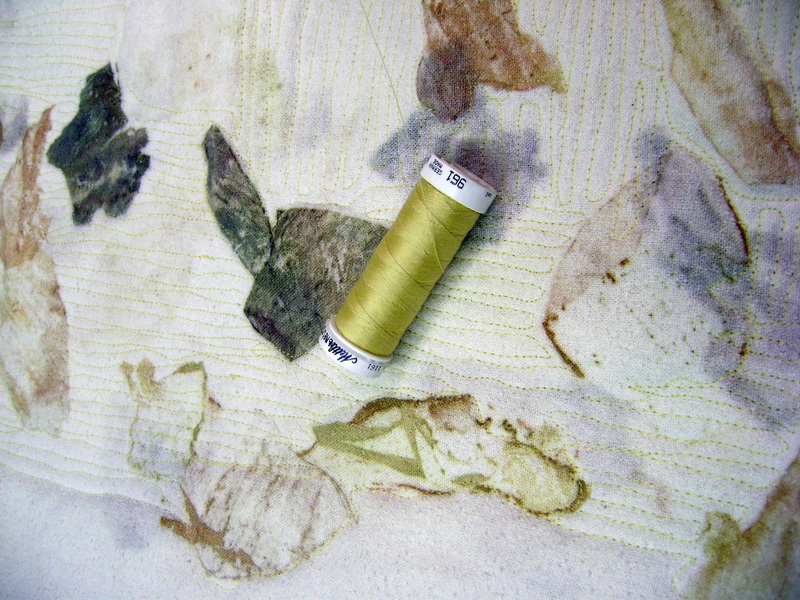 I am working on raw silk, front and back. But how to stitch? 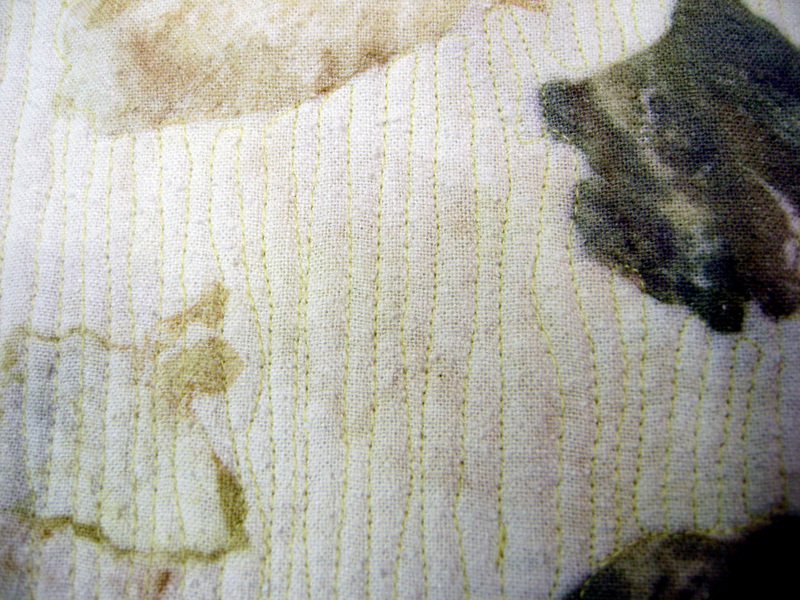 The onion skin marks cry out for “do not ignore me” stitching? I like to do utility line stitching on most things just to get the layers together, but this? The onion marks are talking to me…so I guess I must listen. Check back later to see how I’m doing. I had the blessing of being able to take a day off from my work and go to St. Louis this week to see some of the exhibits of Innovations in Textiles. 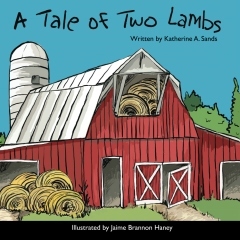 This is a biannual event that takes place in the area. 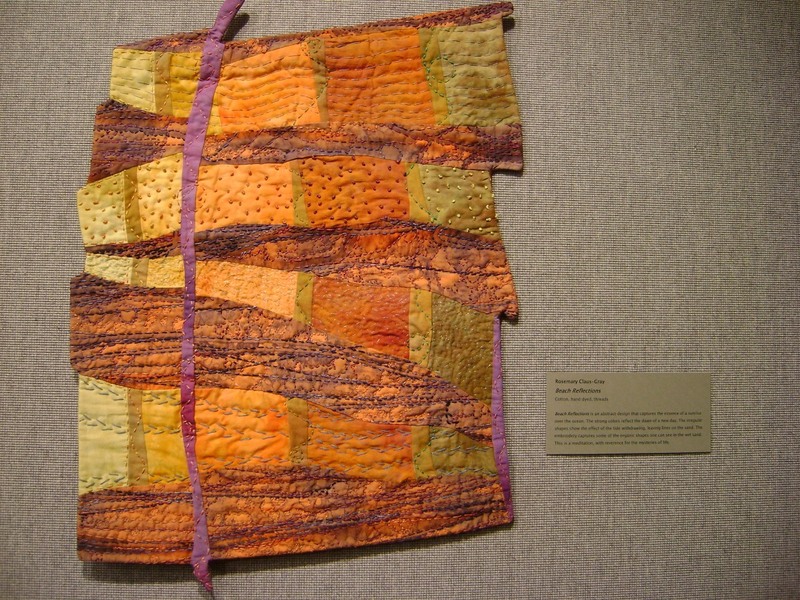 Every two years for a two month period of time, galleries and exhibits major in textiles and fibers; there are also lectures and workshops offered by major textile and fiber artists. 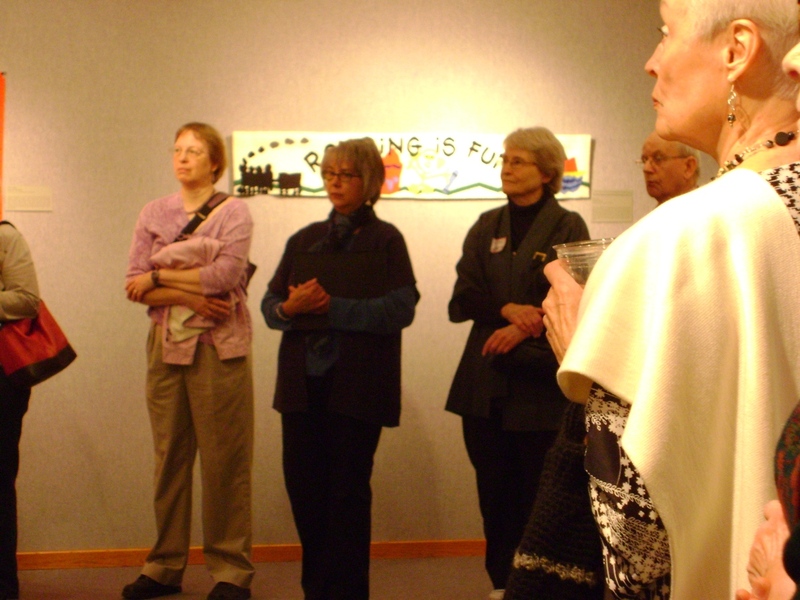 Quilt National travels from Athens, Ohio to the Foundry Art Center in St. Charles, MO. If I lived closer, I’d be majorly involved! But I wouldn’t miss Quilt National at the Foundry. 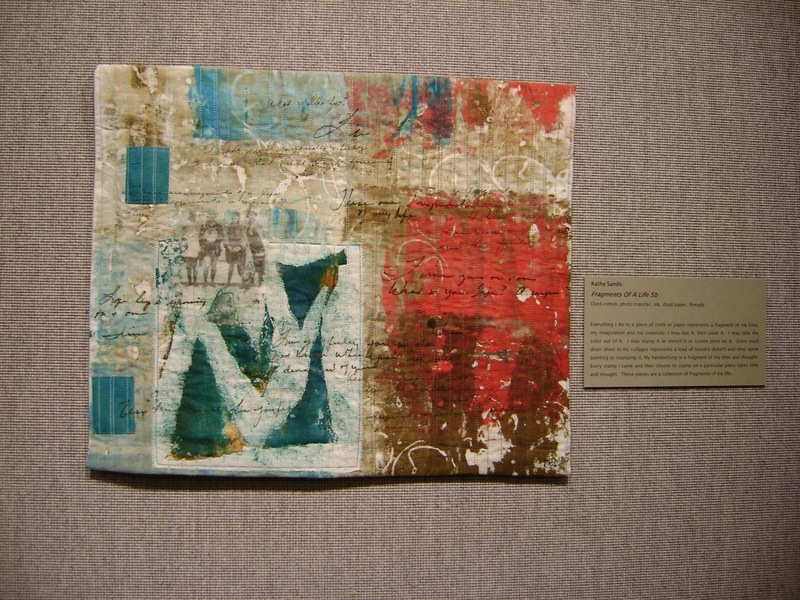 And this year, I had two pieces in an exhibit at Maryville University. 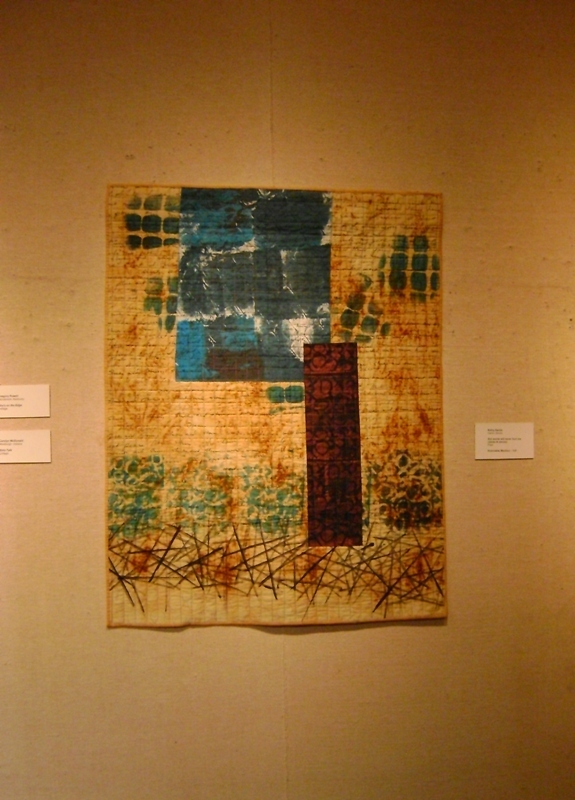 The exhibit is called Speaking of Fibers and was put on by the Missouri Fiber Artists (www.missourifiberartists.com). 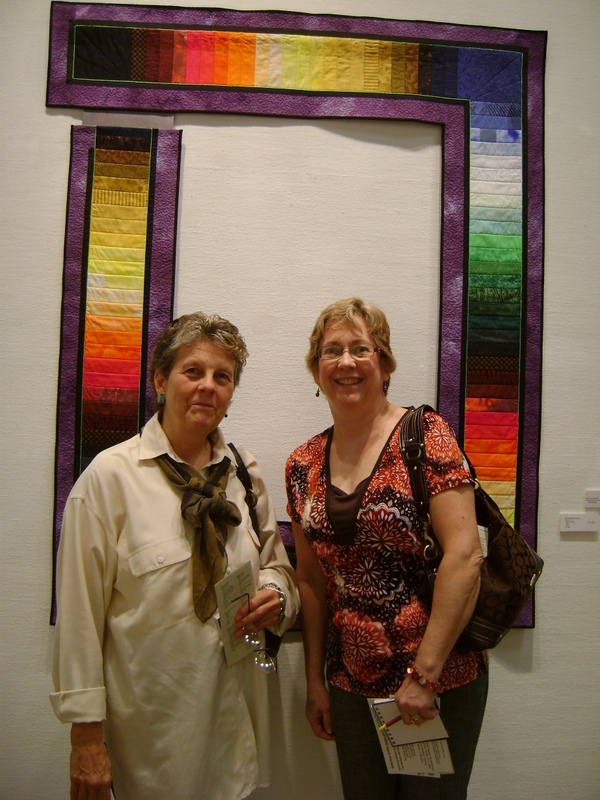 I took photos at Art St. Louis of some of the interesting fiber works in Fiber Focus. 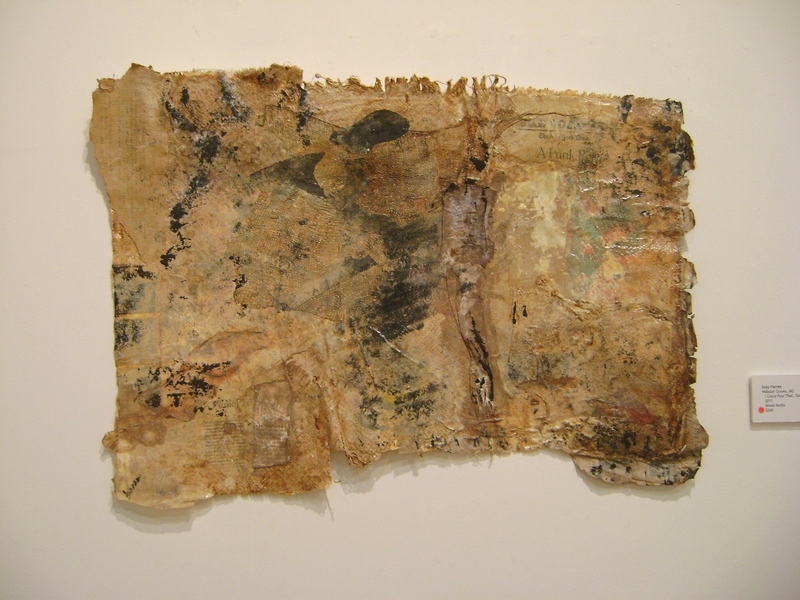 Here’s one by Suzy Farren, a MoFA member. 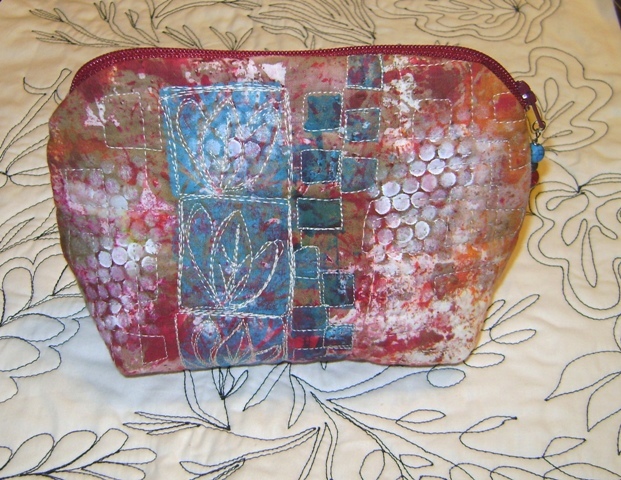 I love what she did with paper and various fibers. I have her permission to share it here. 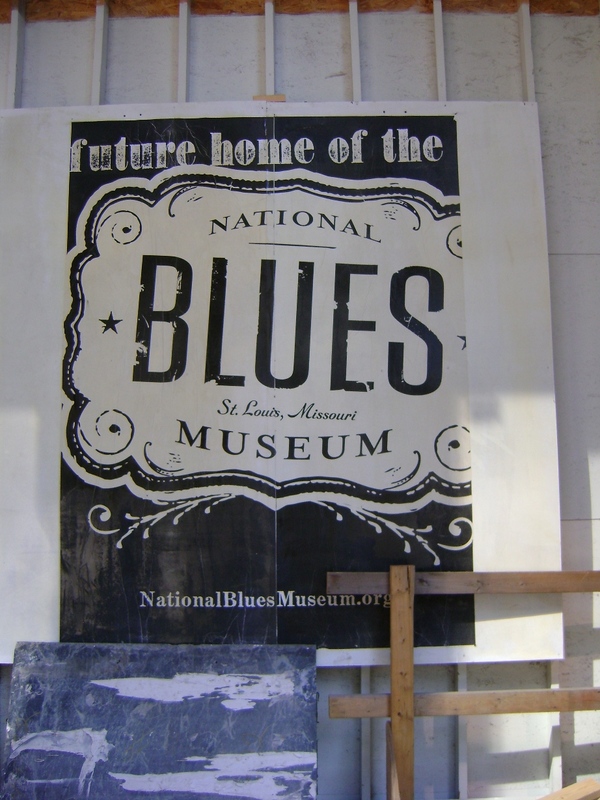 To get to Art St. Louis, we had to pass a building under construction…looks like it will be the National Blues Museum when it is finished. No photos of Quilt National, of course. We ate at Picasso’s Coffeehouse in St. Charles…wonderful place with great coffee…I didn’t take photos of that either. 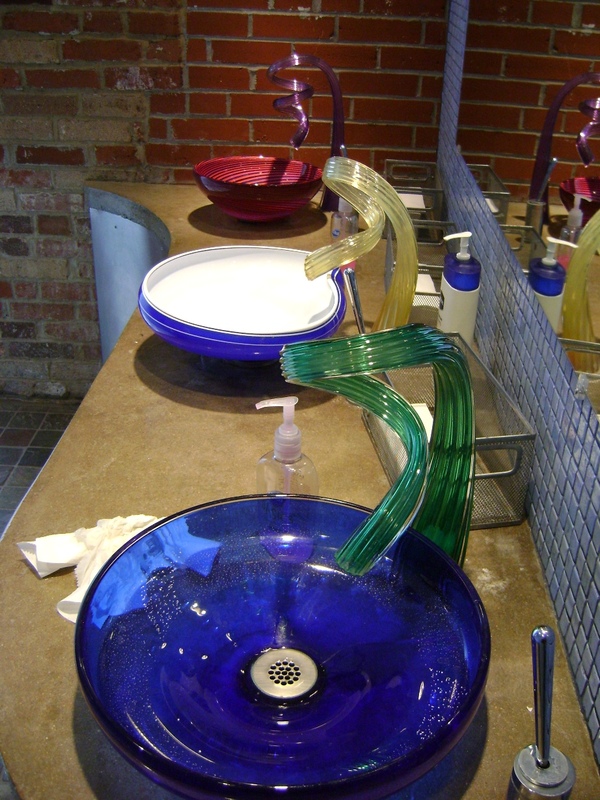 Third Degree Glass Factory on Delmar had marvelously creative sinks and fixtures…. More from the reception…I only know a few of these people! 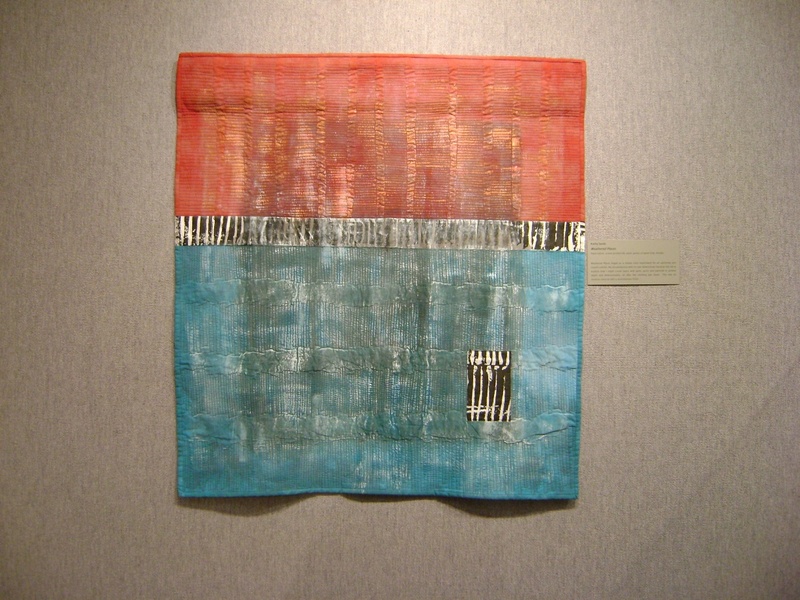 Here’s another piece from the show by Rosemary Claus-Gray. Well, I’m going to wrap this up…it was a fabulous day…now back to working on my exhibit which is less than 3 weeks away! I am starting some new work. Put colors together and piece. Hmmm…not really satisfied with the salmon-ey orange color with the blue….I’m using my handy dandy 3-in-1 Color Wheel Tool. I also sell these now, so contact me if you need one. 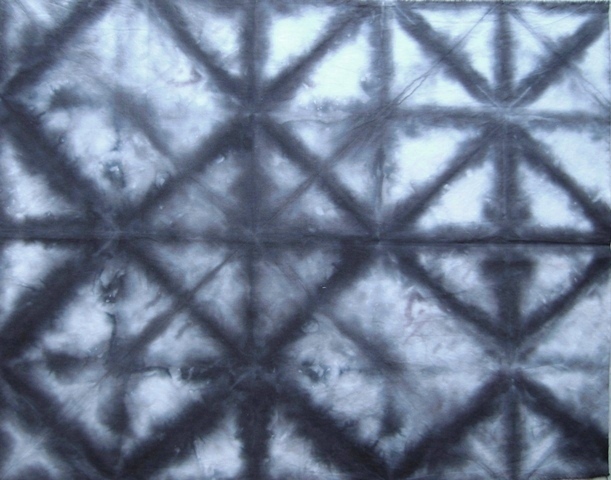 I decided to paint it using either Setacolor or Dye-Na-Flow paints. 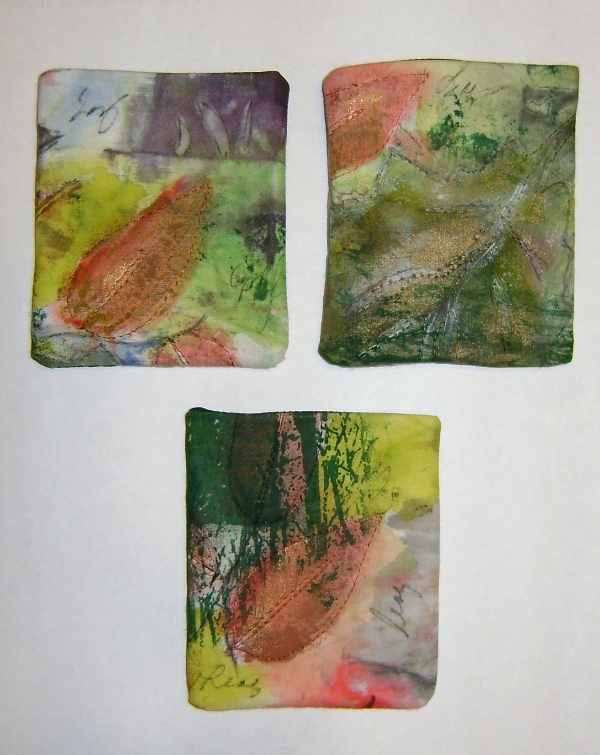 I had forgotten how nice, fluid-y, and pigmented Dye-Na_Flow paints are. 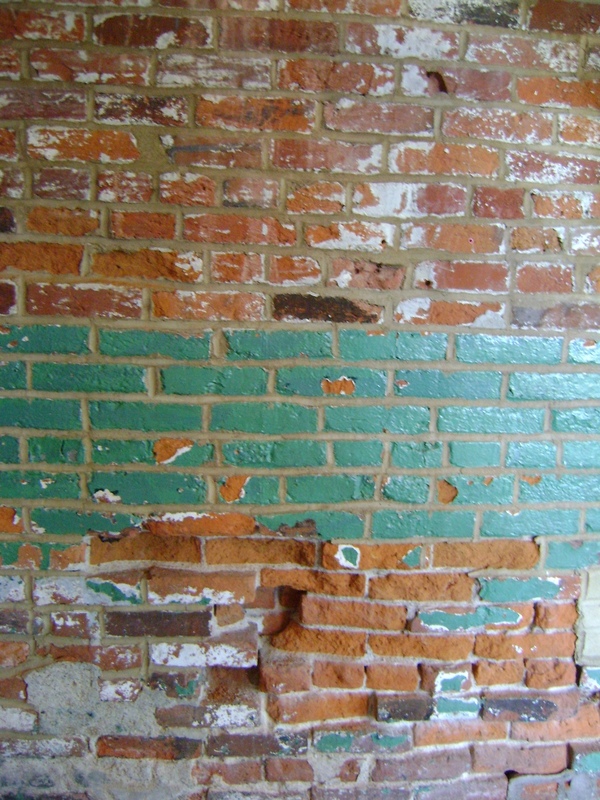 It was the perfect paint for this project. I might have used a different color though. 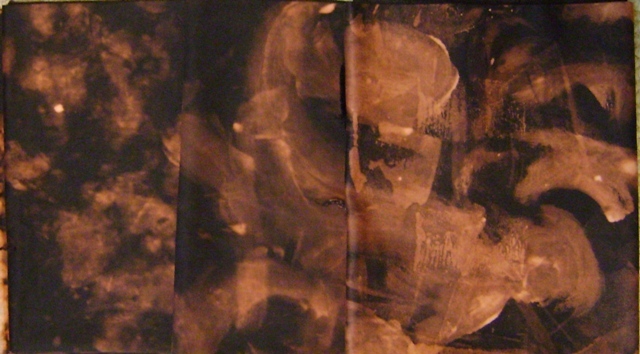 Now I have cheddar as the color for my art. Well, I’ll be doing some other things to it that will tone it down a bit. Hopefully. 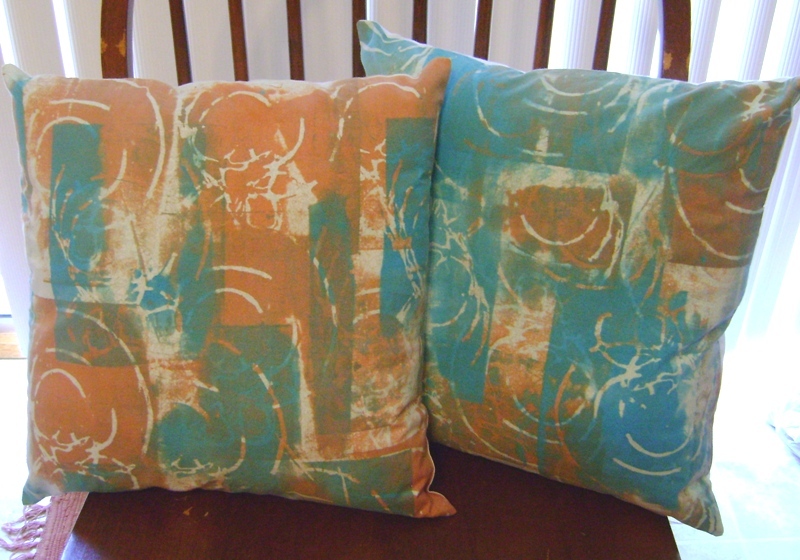 Since I sold my first set of screen printed throw pillows last Saturday, I am now highly motivated to keep going, so I sewed up a few more covers, after cutting lots of fabric for the backs. It’s too hot to be outside printing since we don’t seem to be able to move past 100 plus degree days. But I have lots of indoor work to be done as long as I can keep supplied with everything I need. In my “weakened state” I made a request on Facebook to see if anyone was going to Walmart. Could they check on zippers for me please? One of my friends did go there but they didn’t have any of the polyester zippers I needed for my bags. So I placed an order with Brewer which I needed to do anyway, but wasn’t ready to do it this early. I ordered a bunch of zippers, but they only had one box of the Cloister Brown and I needed many. Sigh. But the three zippers I got are enough to hold me at this moment. 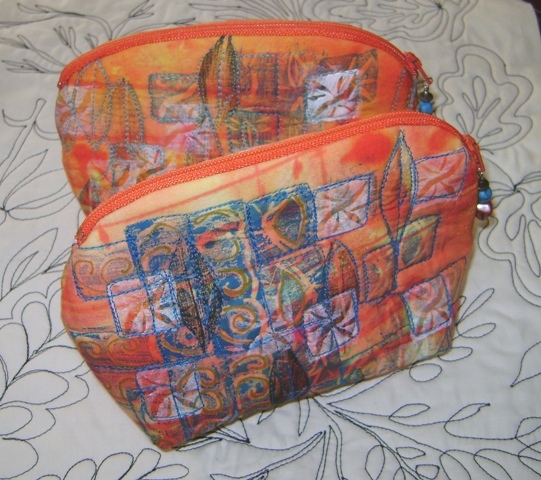 I am making bags which are liners for a basket purse. My friend Kay is a basketweaver and we are teaming up on this project. I think the liners might help her sell the baskets better. 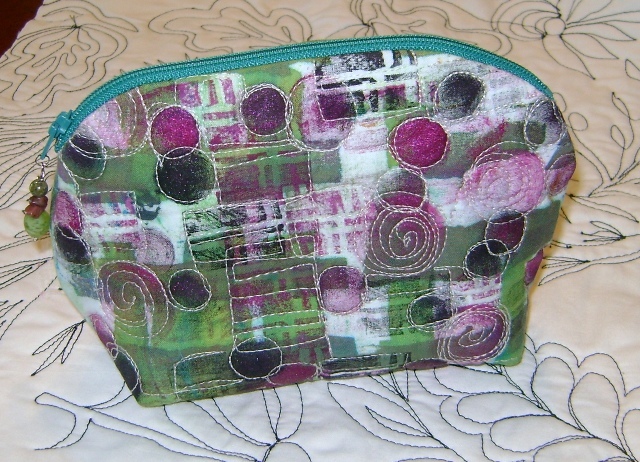 She did sell a purse and liner last Saturday. Woohoo! She has two big shows next month, so I gotta get busy. 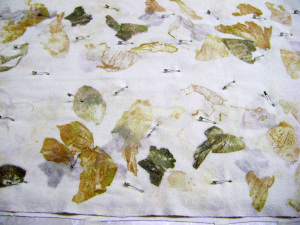 And then there’s my own work…I am giving thought to creating hand dyed cotton napkins with matching table runners. This is for the Select Collection event to be held in November. The theme is home and wearables. 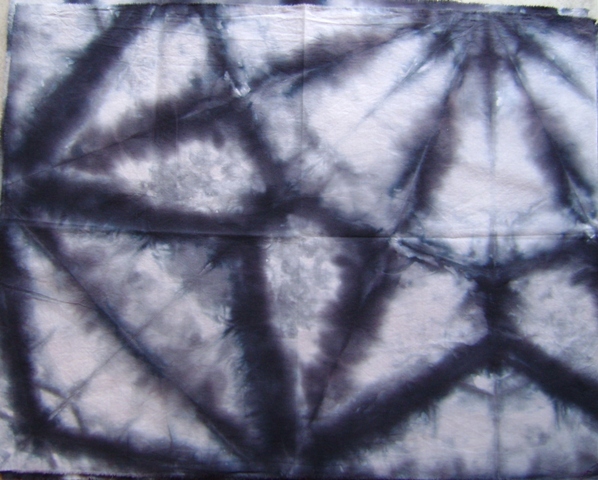 I dyed some shibori designs on fat quarters. Table napkins, anyone? Kay likes them and thinks they would be great as napkins. What do you think? 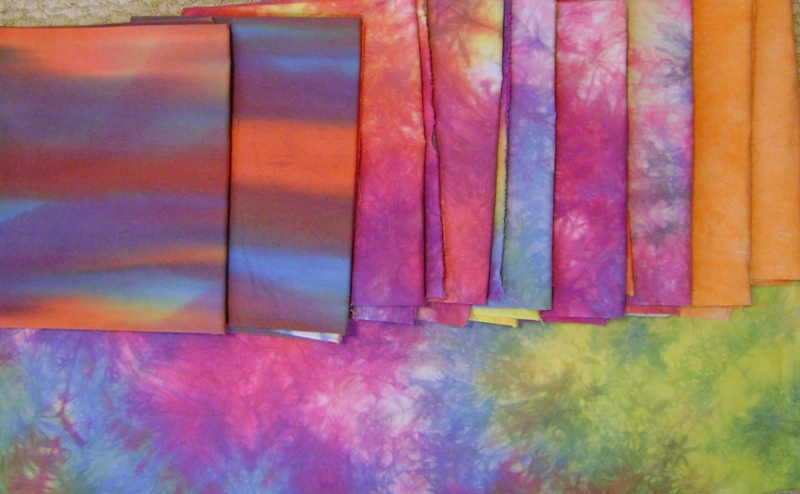 I was given some old dyes and some cloth that had been soda soaked by a friend who is downsizing. The hot weather has finally broken here, so yesterday morning I was out in the patio. I wanted to try out the new screens and I needed to get started working on silk scarves. But for yesterday, I got out a piece of cloth from her stash. 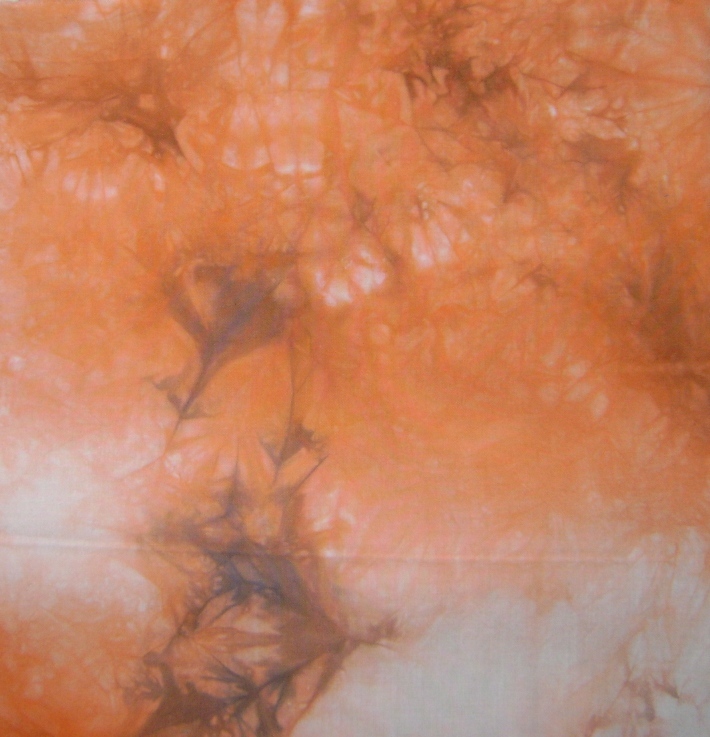 It is a white on white print and is over 2 yards long. I printed on the back of it. 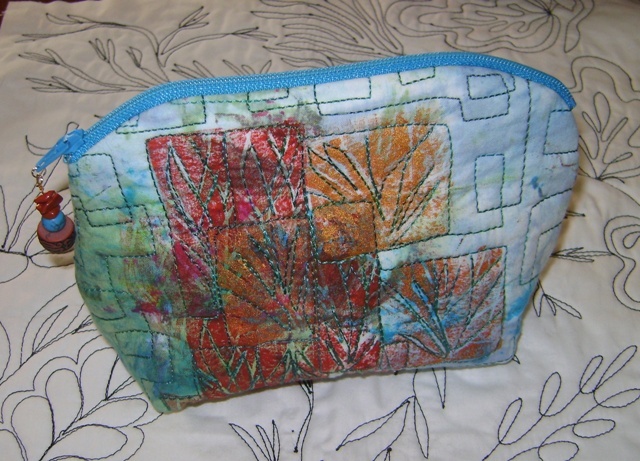 The fabric turned out way too light for my taste, but is still very much useable. I’m not sure if it needed to be soda soaked again or what the reason was. 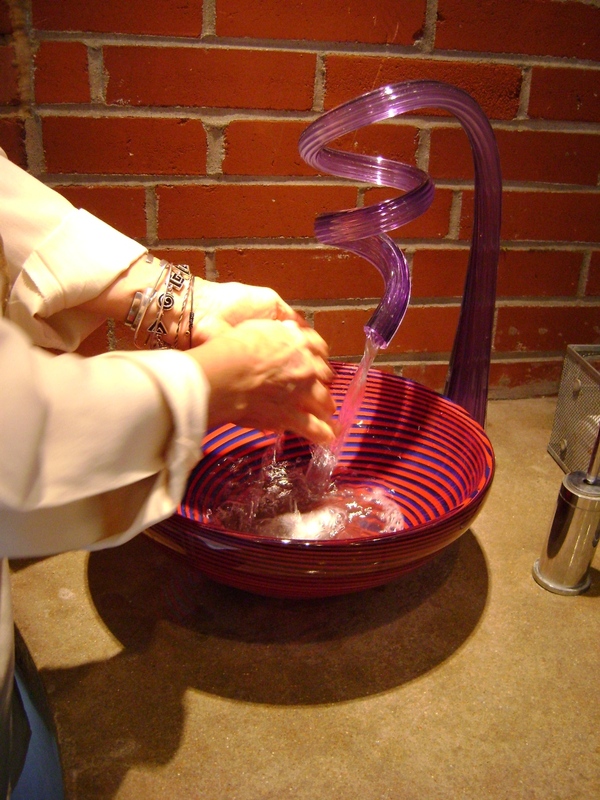 She said it had been soaked last fall…which may be too long ago. I don’t believe I have printed a piece this large before, but I can see myself doing it again. In the lower right corner is printing from one of the new screens we made. 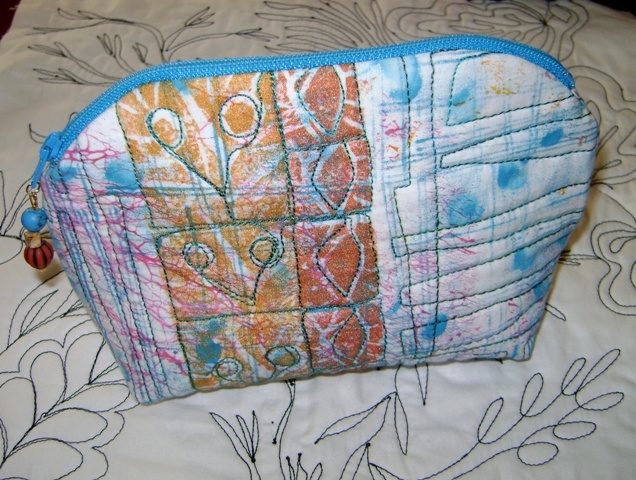 I used a paper resist to make the pattern. 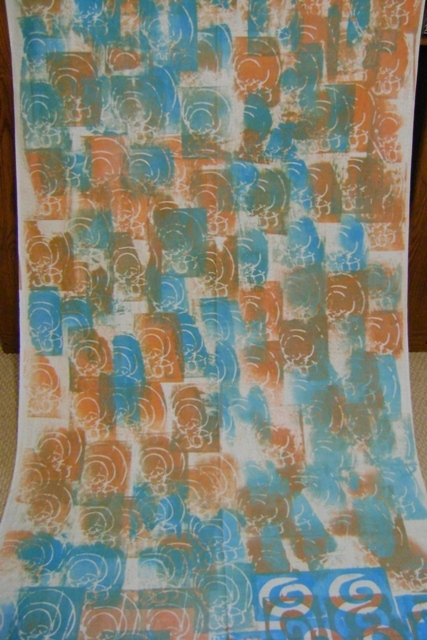 The other printing is from a design made with blue gel glue. 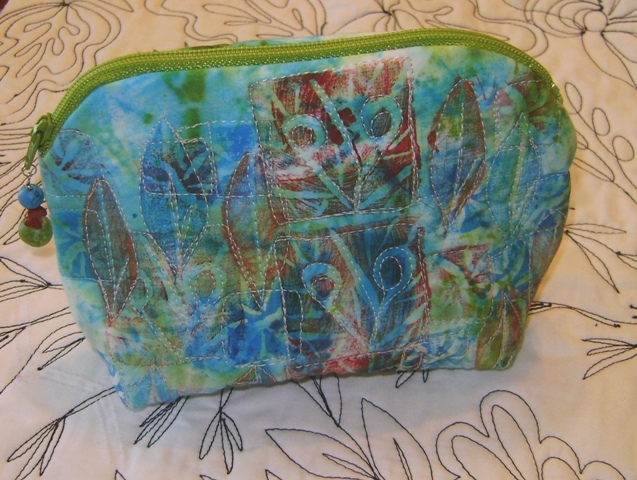 Just above that printing is the turquoise from the older dyes she gave me. I used double the dye powder and thought that would compensate for the age, but apparently not as I can see a distinct difference from the newer dyes. The new screens work quite well. Today, I printed on silk scarves and prepared screens for breakdown printing that I will print on other scarves. One more thing: both of my pieces were rejected for the Working Together show this year….that has not happened before! Oh well…there’ll be another place to enter them. 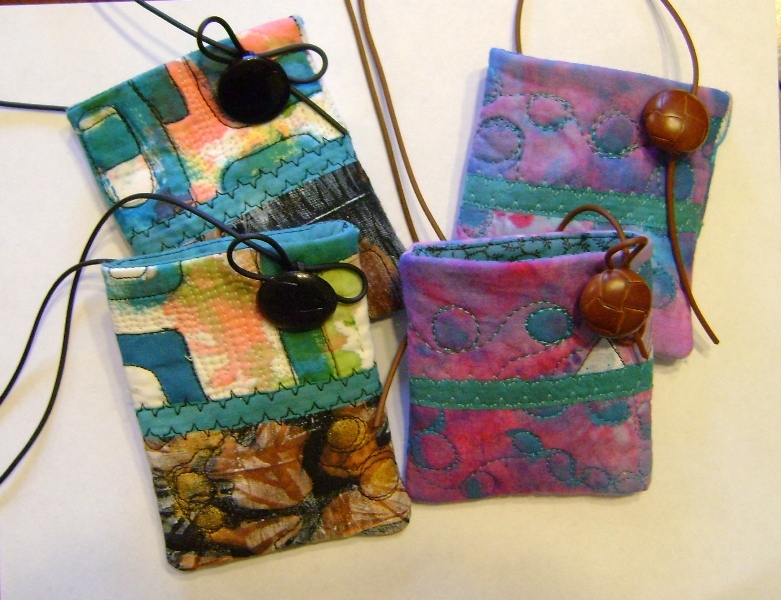 I made these little cell phone/credit card pouches last week. 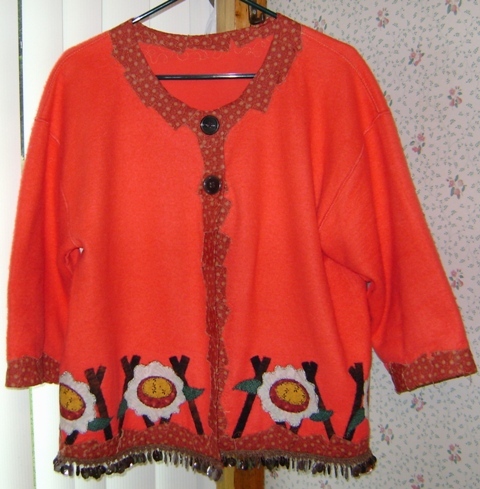 The bottom one is sold and I am awaiting her buttons to sew on it. The other two are in my etsy shop. 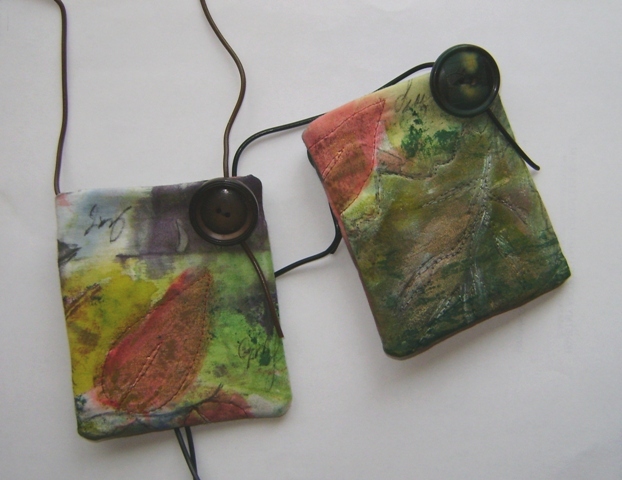 One has a cool dark green antique button on it and the other has a dark brown one. The Artisan’s Fair at New Harmony was better than last year in sales. Maybe everyone was really scared last year and they aren’t so much this year. The crowd wasn’t massive, but there was a fairly steady flow of people and they were buying. I sold several scarves each day. Although not blockbuster, I am pleased with my sales. 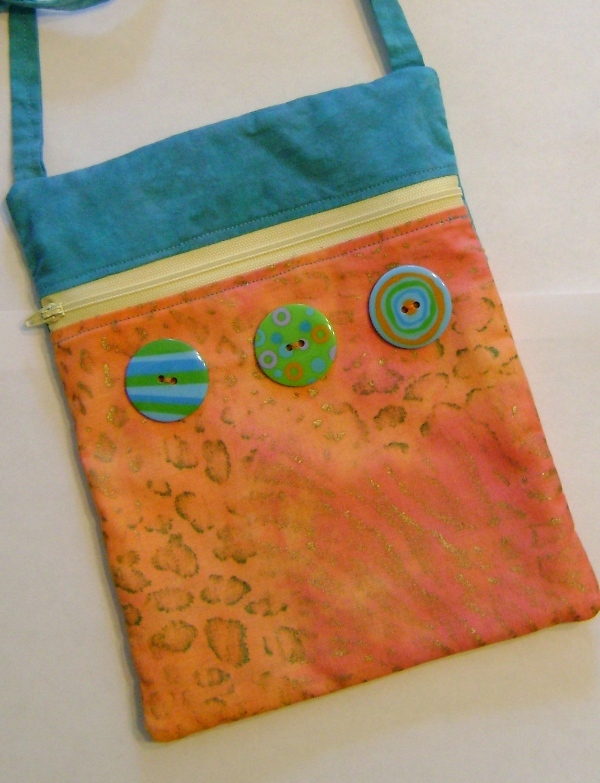 To purchase one of the two bags in the last picture, click here. At least I’m having fun!!!!! It’s been awhile again since I’ve blogged…I’m getting so lazy! 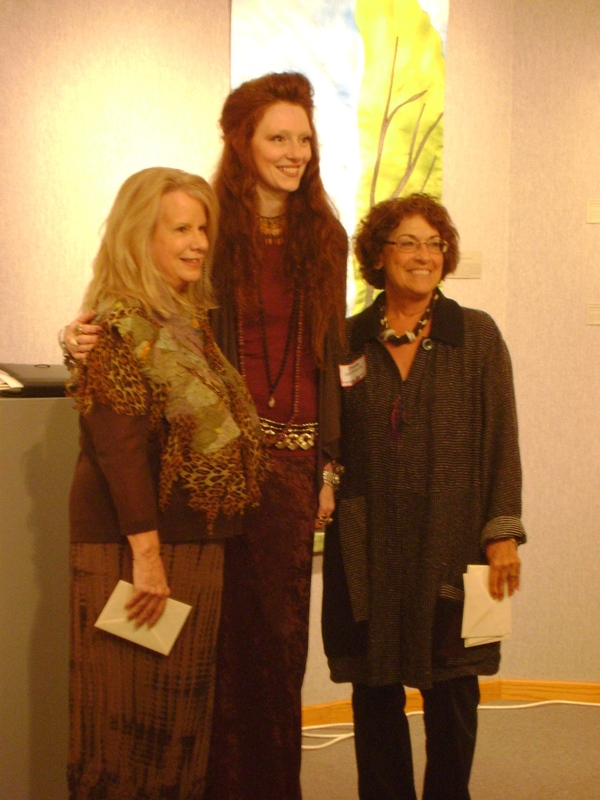 Update on the Arts Council show…I got a call last Wednesday that I have been awarded an Honorable Mention award…yeah for fiber! Rayna wrote me a nice note and said that this is extra special because this is recognition in an art show. Thanks, Rayna. 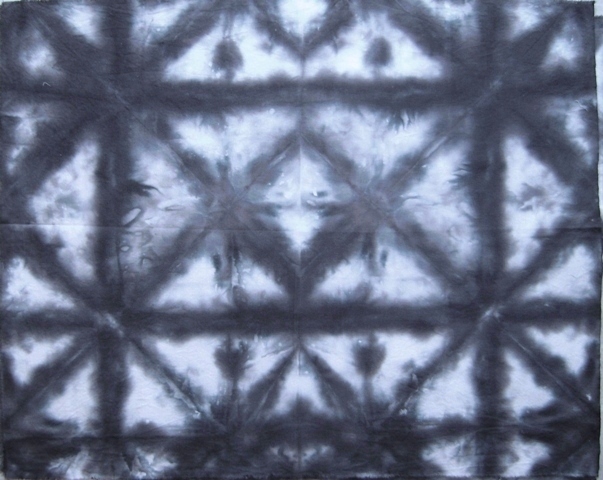 I have been dyeing some fabric to replenish my supply. The multicolored ones sell pretty well for me. The striped ones were hung on the clothesline and I poured the dye on them. That was sorta fun if you can keep the dye off your toes…I may do more, mostly because I would like to use them myself. I also soda soaked some white cotton and hung on the line…and guess what showed up? The Japanese beatles swarmed the white cotton…go figure…they must like the soda ash. 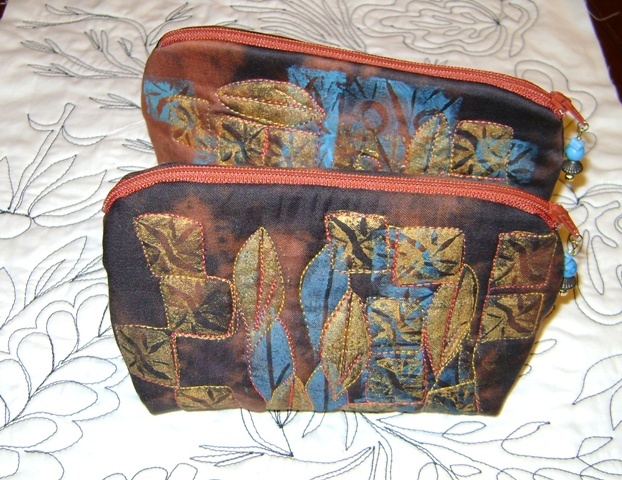 Last week I prepared some discharged black sateen pieces to sell and to stitch on. 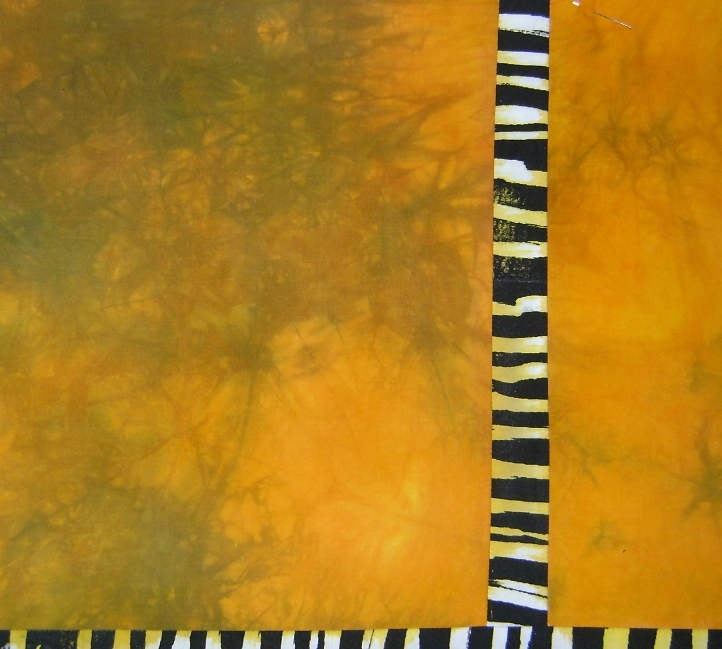 I will be making more of these…”painting” on black cloth with dishwashing gel is too much fun.